While not quite as well known in some areas as Kindles, Kobo eReaders are a popular option for book lovers in many countries. After the success of the Canadian-turned-Japanese company's limited edition Aura HD, Kobo is targeting the high end eReader market with a new Aura. The device features a 6-inch 1014 x 758 E Ink pearl display, an unspecified 1 GHz processor, 4 GB of internal memory, a microSD slot (up to 32 GB cards), 802.11 b/g/n wifi, a Micro USB port, around two months of battery life, and a surprisingly good front-light. Measuring 150 x 114 x 8.1 mm (5.9 x 4.49 x 0.32 inches) and weighing just 174 g (6.1 ounces), the Aura is both smaller and lighter than the current Kindle equivalent. It also has the advantage of supporting more formats and not locking buyers into a single ecosystem (no matter how good Amazon's might be). Pocket will also be supported by the new gadget thanks to a partnership with the San Francisco based company. Pocket is a platform that allows users to save web based content across platforms to read at a later time, online or off. This new feature certainly adds versatility to Kobo's new product. The Kobo Aura is available for pre-order now in Canada, the United States, the United Kingdom, Australia, and New Zealand starting at US$149.99. The eReader will be available in store as of September 16th. New York - August 28, 2013 – Kobo, a global leader in eReading, hosted an event in New York City to officially unveil its new device lineup including the Kobo Aura 6” E Ink eReader and the Google-certified Kobo Arc 10HD, Kobo Arc 7HD and Kobo Arc 7 tablets in addition to new content categories, strategic partnerships, and Reading Life experience. Kicking off the evening, Michael Serbinis, CEO of Kobo, discussed the 25-year transformation of the eReading market. With the industry still in the early days of this transformation, Kobo is the only company truly focused on the most passionate Readers. “We knew this transformation would be global from the outset. It would change how people read around the world and affect readers everywhere,” noted Serbinis. Introducing the new fall lineup of devices truly focused on the reading experience, Serbinis offered an inside look at the Kobo Aura E Ink eReader, Kobo Arc 10HD, Kobo Arc 7HD and Kobo Arc 7 tablets, as well as new partnerships and growing library of content. 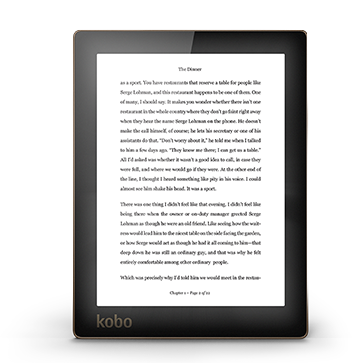 Putting reading first, Kobo introduced Reading Life. 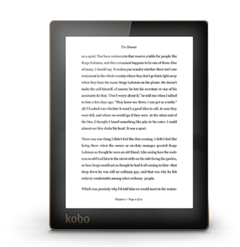 Kobo’s exclusive Reading Life user experience gives Readers access to all the content they love to consume, and allows them to customize based on their reading habits. On Kobo’s new tablets and E Ink eReaders, Beyond the Book offers a way for passionate Readers to explore content by discovering books, curated content collections, and online materials related to their latest reads and areas of interests. As part of last night’s announcements, Kobo also introduced the first-ever E Ink eReader Pocket integration. With people reading more, at different times and in different ways, the Kobo and Pocket integration offers a convenient platform for Readers to access Web content easily and on any device they choose—regardless of internet connection. The Pocket integration is available across all of Kobo’s new devices. In addition to the new product lineup and Pocket integration, Kobo revealed details around new content partnerships with top magazine publishers including Condé Nast, Hearst Corporation,TIME, American Media, Mansueto, Bauer Publishing Group, Mondadori, Rogers Publishing Limited, and Reader’s Digest. Kobo also enhanced its bookstore with a new Kids Store, making it easier to find great books for children and young adult Readers. Parents will have the ability to set up dedicated accounts so that kids can safely explore the more than 100,000 titles in the Kobo library, set spending allowances and adjust search-settings for safe reading. To access high-resolution images of the event, please click here.